'Tis the season to be jolly? Not entirely. 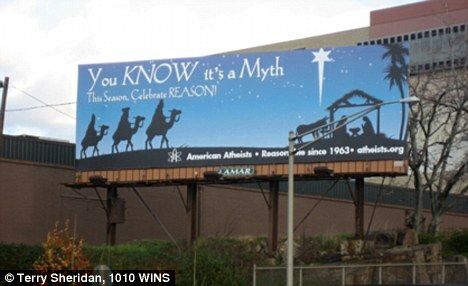 An atheist billboard that calls Christmas "a myth" has sparked a growing controversy near the Lincoln Tunnel, a 1.5-mile-long twin tube that connects New Jersey to New York. The full message, which appears with a nativity scene, reads: "You know it's a myth. This season, celebrate reason." Its $20,000 price tag was paid for by American Atheists, a New Jersey-based atheist advocacy group, David Silverman, the group's president, told CNN. "We are addressing the 50 million atheists in this nation," Silverman said. He said the group erected the sign in a high-traffic area in an effort to challenge drivers to "think hard about whether or not they actually believe in what is, in reality, an invisible magic man in the sky." Silverman said he is uncertain if it will stay through Christmas or come down on December 21. The sign, located near the tunnel's New Jersey entrance, has stirred controversy among Christian organizations, prompting one group to erect its own pro-Christmas billboard. "We decided to counterpunch after a donor came forward seeking to challenge the anti-Christmas statement," said Bill Donohue, president of the Catholic League, a New York-based Catholic advocacy group. The League's billboard reads: "You Know It's Real: This Season Celebrate Jesus." It was erected at the tunnel's Manhattan entrance at a cost of $18,500, according to Donohue. This is not the first time atheist billboards have called religion into question. The Freedom From Religion Foundation, a Wisconsin-based atheist advocacy group, has placed comparable billboards in some 45 cities and 30 states since October 2007, according to the group's co-president, Annie Laurie Gaylor. In 2008, the British Humanist Association paid for buses in London, England, to be adorned with the slogan: "There's probably no God. Now stop worrying and enjoy your life." But Donahue says such signs are antagonistic. "I'm not Hindu, I'm not Buddhist, I'm not Jewish but I wouldn't go around denigrating other people's religions and their gods," he said. "[Silverman] ought to respect our religion. He doesn't have to join it." Silverman says the holiday season has been co-opted by newer traditions.